After Mom’s two hip breaks and a diagnosis of early stage Alzheimer’s, it was clear to my sister and me that some tough decisions needed to be made. The part time caregiver we had hired to assist mother at home was not going to be enough anymore. And the upkeep and expense of a 4000 square foot house did not seem prudent. Add to that, the fact that I lived an hour away and my sister -four hours – clearly something had to change. So we arranged for Mom to come and live in an assisted living facility just minutes from my house. I could leave my workplace at lunch to check on her or stop by on my way home from work. We also hired a private caregiver for five hours, several days a week to provide Mom with personal attention. All the staff knew that if I was needed, I was just minutes away. Fast forward to this past weekend. My sister came in to town with her youngest daughter and our entire weekend was dedicated to time with mom and doing things she enjoyed. I ignored the chores at my house and the work project that needed some weekend effort. Friday evening dinner was at her favorite restaurant, Bob Evans! Saturday we spent out and about, taking her to lunch, looking at the newest Vera Bradley items in a local shop (mom loves Vera Bradley) and then back to my house for a home cooked dinner. Later that evening, as we pulled up to Hilltop Manor the assisted living where mom is now living, she sighed and said “ I just feel like I’m on a desert island and no one cares about me”. So much for the time spent with us all day! My sister and I shared a glance and we too, sighed. I guided mom and her walker into the front door of Hilltop Manor and immediately saw a resident walking quickly toward me and the door. She was in a lovely blue matching gown, robe and slippers and the look on her face was one of angry determination. A few steps behind her, trying to catch up with her, was one of the facility staff members. I immediately knew my role and I planted myself in the doorway – much to my sister’s surprise as she slammed into my back. I responded, as I solidly blocked the exit, “ Oh, I’m so sorry. We were just coming in and bringing my mother home.” By that time the staff member had caught up with the would-be escapee and gave me a grateful look. My sister and I tried to ease our way past this lively discussion and catch up with our mother who was standing by the elevator to go to her second floor room. “Well, how about if we go and call Sue Ann and tell her good night?” said the staffer. 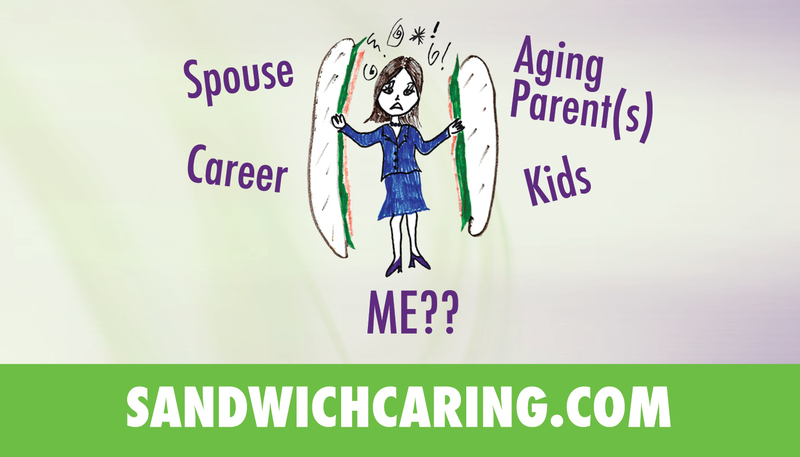 Such is the life for we who are “sandwich caregivers”. This entry was posted in Uncategorized on May 9, 2013 by janestory.